Below are selected items from the Stolen Art Alert section of the IFAR Journal, published by IFAR since 1977. The theft information was provided by owners and insurance companies to the police, the FBI, Interpol, the Art Loss Register, and others, and IFAR does not make any representation as to accuracy or authenticity. Our Lady of the Quail. 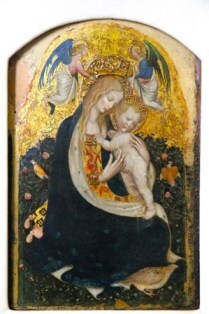 One of 17 paintings stolen from the Museo Civico in Castelvecchio, Verona, Italy on November 19, 2015 and recovered in Odessa, Ukraine on May 11, 2016 with the help of the Carabinieri, Moldova, and Ukrainian authorities. 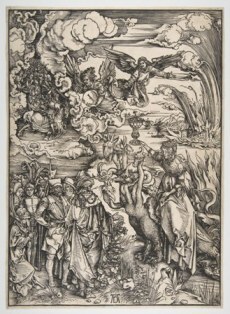 Woodcut from the Apocalyptic Cycle. Signed at bottom center: AD. Stolen from the residence of opera director Otto Schenk in Oberhofen, Switzerland between February 2 and March 21, 2016. A Cavalier, or Self-portrait as an Officer. Stolen from the Art Gallery of New South Wales in Sydney, Australia on June 10, 2007. 48.21 x 75.01 cm (approx. 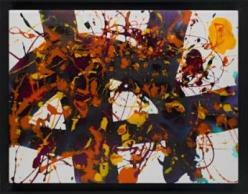 19” x 29 ½”). Signed with the artist’s monogram at center right. Stolen from a private residence in Lons le Saulnier, France on March 6, 2014. 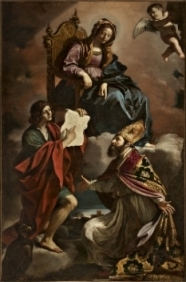 The Madonna with Saints John the Evangelist and Gregory the Wonderworker, 1639. 292.99 x 184.51 cm (approx. 9 ½’ x 6’). Stolen from the Church of San Vincenzo, Modena, Italy on August 10, 2014. Recovered by the Carabinieri in Casablanca, Morocco in March 2017. 46 x 61.01 cm (approx. 18 ¼” x 24”). Stolen from a gallery in Toulouse, France on August 27, 2013. Recovered by police in Portugal in March 2016. 68.99 x 48.01 cm (approx. 27 ¼” x 19”). Stolen from a business in Nordrheinwestfalen, Gemany on January 16, 2015. See also item nos. 49,55; 65-70; 72-74. Gold filigree and repoussé, coral, pearls. Ht: 24.99 cm (approx. 9 ¾”). One of 20 items by unknown artists – assembled in 1863 by Empress Eugenie for her Chinese Museum at the Fontainebleu château -- snatched from display cases at the museum in an early morning burglary on March 1, 2015. Poppy Flowers (Vase with Flowers), 1887. Stolen from the Mahmoud Khalil Museum, Cairo, Egypt on August 20, 2010. Recovered on January 2, 2019. 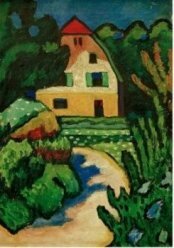 The same painting was stolen once before -- in 1978 -- and recovered in Kuwait in 1980. Depicting a lioness killing a Nubian. Reported stolen/looted in April 2003 from the Iraq Museum, Baghdad.